Nearly four and a half months after its last launch ended in failure, the Indian Space Research Organization (ISRO) is looking to return its workhorse Polar Satellite Launch Vehicle (PSLV) to service with the flight of the Cartosat-2ER Earth-observation satellite and 30 smaller, secondary payloads. ISRO is currently targeting a launch date of January 11, 2018, at 10:58 p.m. EST (January 12, 2018, at 03:58 GMT). Taking center stage on this mission is the fourth of the upgraded Cartosat-2 series of Earth observation satellites. 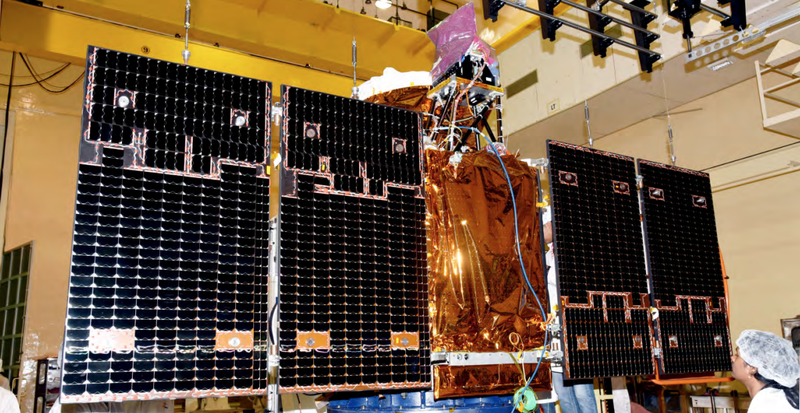 Like its predecessors, Cartosat-2ER is built on the IRS-2 spacecraft bus. The indigenous design sports twin solar arrays, which are capable of producing more than 900 watts of power to the spacecraft’s operations. The 1,570-pound (712-kilogram) spacecraft is outfitted with two primary instruments — the Panchromatic Camera (PAN) and the High Resolution Multi-Spectral Radiometer (HRMX). Capable of producing black and white images in a selected portion of both visible and near-infrared spectra, PAN will have a resolution of 26 inches (65 centimeters) from its 314-mile (505-kilometer) high, Sun-synchronous orbit. Though less sharp, HRMX can capture the entire visible spectrum — as well as a portion of the near-infrared — across four channels with a resolution of 6.6 feet (2 meters). India will use the information gathered from this, and other Cartosat satellites, to meet a broad range of needs on the sub-continent. Indeed, not only has the Cartosat series allowed the country to address the needs of a growing India, it has been able to do so with a significant cost savings. Prior to having their own stable of Earth observing satellites, India used to pay $20 per square kilometer for imaging from Ikonos. The Cartosat program, in comparison, has lead to a 20-fold reduction of imaging costs for the country. The Cartosat satellites have a planned lifetime of at least 5 years. India has positioned itself as a leader in launches featuring multiple payload deployments. In fact, ISRO currently holds the record with 104 satellites deployed on a single mission. Though this flight, designated PSLV-C40, won’t come close to that, it will nonetheless deploy 30 secondary payloads. 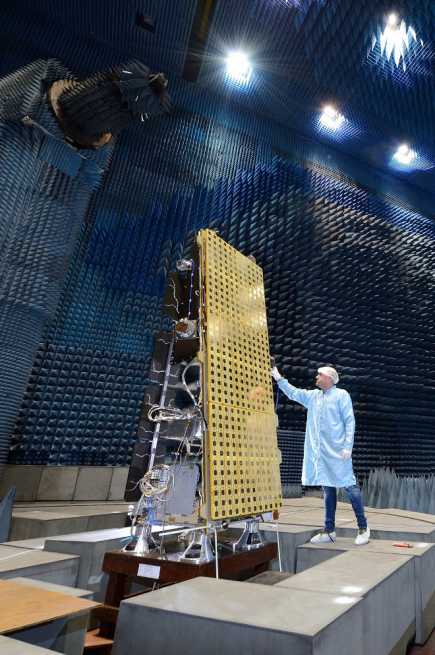 The largest of the secondary payloads is UK-based Surrey Satellite Technology Limited’s (SSTL) NovaSAR-S. Tipping the scales at 948 pounds (430 kilograms), the synthetic aperture radar (SAR) imaging system can peer through haze and clouds to produce detailed radar imagery, day or night. Though NovaSAR-S is meant to be a technology demonstrator, it has already generated interest from third parties wanting to take advantage of the spacecraft’s capabilities. In fact, SSTL recently signed a deal with Australia’s Commonwealth Scientific and Industrial Research Organisation (CSIRO). The arrangement gives the Australian organization the ability to take a 10 percent share of the tasking and data-gathering capabilities of the satellite. “The aim is to manage the The [sic] NovaSAR satellite as a natural extension of the significant role CSIRO already plays in managing a range of National Facilities, on behalf of the Australian community of scientists and for the benefit of the nation,” noted Dr. Dave Williams — Executive Director of Digital, National Facilities and Collections at CSIRO — in a press release. “Because we’ll be able to direct the satellite’s activity, it provides significant opportunities to support a wide range of existing research, further develop Australia’s earth observation data analytics expertise, and create new opportunities in the field of remote sensing,” concluded Williams. Joining NovaSAR-S will be another SSTL creation: Carbonite 2. The microsatellite uses both a commercially-available camera and a 9.8-inch (0.25-meter) telescope to provide images with a surface resolution of 4.9 feet (1.5 meters). Once its mission is complete, it will deploy a drag sail to accelerate deorbiting in an effort to reduce litter in Earth’s low-orbit space. Other than the two spacecraft from the UK, PSLV-C40 will play host to 28 other secondary payloads from the United States, Finland, South Korea, Canada, and India. 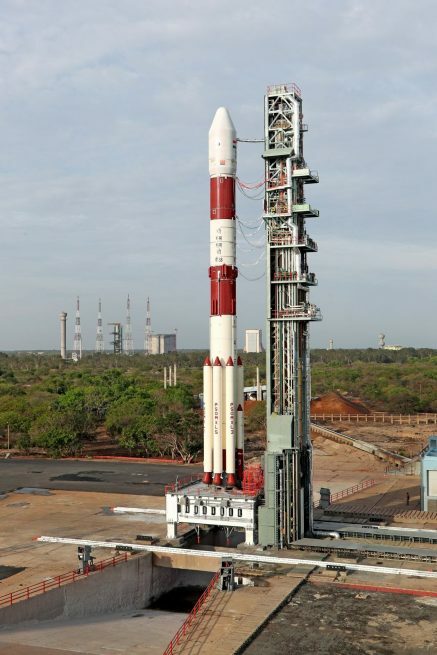 Ferrying Cartosat-2ER and its 30 co-passengers to space will be ISRO’s PSLV rocket. Outfitted in its extended, or XL, configuration, the vehicle is capable of lofting 3,968 pounds (1,800 kilograms) to a Sun-synchronous orbit. When launched in the XL arrangement, the PSLV has six strap-on S12 solid-fueled motors. Each of the 3.3-foot (1-meter) diameter boosters provide 162,000 pounds-force (719 kilonewtons) of thrust and burn for 49 seconds prior to being jettisoned. Of the six boosters, four are ignited on the ground, with the remaining two coming to life approximately 25 seconds into flight. In contrast to vehicles used by most other launch providers, the medium-lift PSLV makes use of solid propellant not only in its boosters, but also on several stages on the core vehicle itself. In fact, the PSLV’s first stage is one of the largest solid-fueled motors ever flown, trailing only the boosters flown during the Space Shuttle program and those used on Arianespace’s Ariane 5. The first stage’s 9.2-foot (2.8-meter) diameter S139 solid motor produces 1.1 million pounds-force (4,800 kilonewtons) of thrust, and will burn for 105 seconds. Interestingly, the S139 does not use a vectored nozzle for attitude control; rather, it injects strontium perchlorate into the motor’s stationary nozzle to produce an offset thrust. This unbalanced force is used to precisely steer the vehicle. Additionally, roll control is addressed by two externally-mounted thrusters. The PSLV’s second stage is powered by a single Vikas engine. The liquid-fueled engine — burning a mixture of unsymmetrical dimethylhydrazine (UDMH) and nitrogen tetroxide — produces 180,000 pounds-force (799 kilonewtons) of vacuum thrust and operates for 158 seconds. The third stage sees a return to a solid-fueled motor. The stage’s HPS3 motor burns the same hydroxyl-terminated polybutadiene (HTPB) fuel as the first stage and strap-on boosters. The HPS3 burns for approximately 83 seconds, and provides 54,000 pounds-force (240 kilonewtons) of vacuum thrust. The fourth, and final, stage is powered by two L-2-5 liquid-fueled engines. The tandem produces a total of 3,400 pounds-force (15.2 kilonewtons) of thrust, consuming a mixture of monomethylhydrazine (MMH) fuel and mixed oxides of nitrogen (MON) for the oxidizer. The engines can operate for up to nine minutes, depending on the mission’s needs. The PSLV has flown 41 times since 1993, 18 of which were in the XL configuration. Overall, the PSLV has a 92.68 percent success rate, and 94.44 percent for the PSLV-XL. This will be ISRO’s first launch of 2018, and their first since the failure of PSLV-C39 on August 31, 2017.